Recently a royal tomb of the Andean Wari culture was excavated in Peru about 175 miles north of Lima. It contained the mummified bodies of 57 royal women and 6 female servants (assumed sacrificed). The site is El Castillo de Huarmey. It’s always exciting (especially for art historians) to hear about new excavations and new discoveries that shatter long-held beliefs about ancient cultures. This particular excavation— which contained three women rulers— has apparently revealed that women were more important in ancient Andean cultures than previously believed, because of the richness of their burial jewelry and number and apparent rank of the attendant female mummies. The Wari culture is thought to have unified the various Andean cultures into a single empire by the year 600 ce. The name of the culture comes from the central city of Wari. Other impotant centers of the culture were Virachochapampa and Pikillaqta, 700 kilometers north and 250 kilometers southeast of Wari. The Wari empire was probably the first unified state in the Peruvian Andes, and formed the basis of what the later Inca conquered. Both the Chimú (flourished 900–1500 ce) and the Inca (1438–1534) cultures are descendants of the Wari. 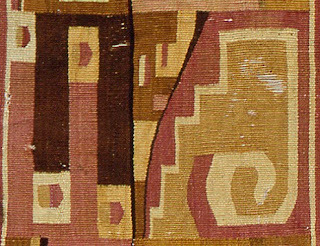 The textiles of ancient Peru, woven in every technique known for over three thousand years, represent a significant achievement of ancient Andean civilizations. They were highly prized, second only to gold. So many textiles have survived because they were part of burial rituals (in the arid coastal plains), such was their value. 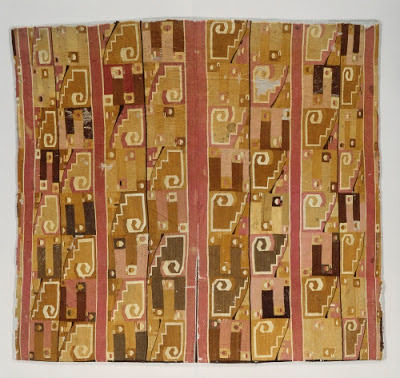 Wari weavers abstracted human and animal forms and explored geometric abstraction as the major themes of their textiles. This highly analytical abstracting of forms has, by art critics, been compared to Cubism. Indeed, it may have been influenced the Cubism of Pablo Picasso (1881–1973, Spain) and Georges Braque (1882–1963, France). This tunic has six columns of alternating squares: outlined step fret and one half abstracted faces with split eye and abstracted four animal heads on two u-shaped bodies with characteristic split eyes. Also check out the art of the Tiahuanaco (Tiwanako), a concurrent culture.